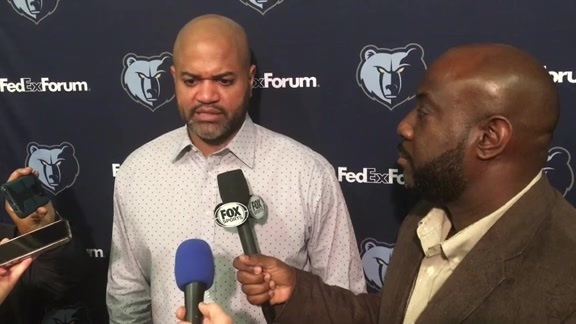 Grizzlies coach J.B. Bickerstaff spoke with Mike Wallace following Thursday’s loss to the Thunder at Chesapeake Energy Arena. 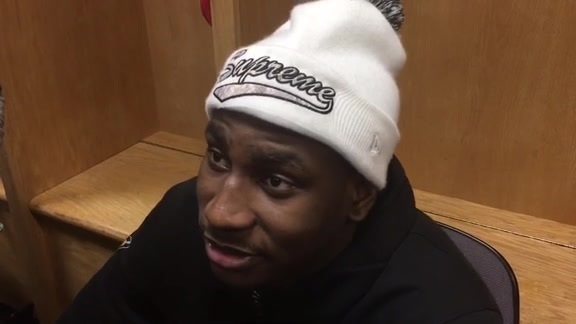 Jaren Jackson Jr. shares his take on what happened during tonight’s game against the Thunder. 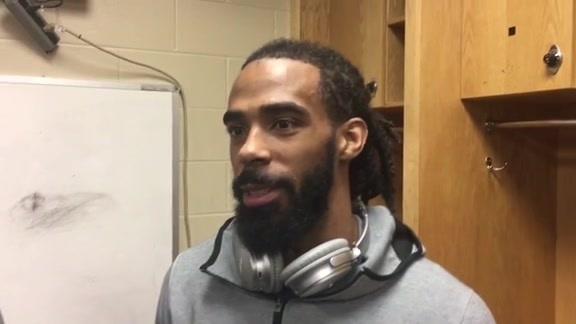 Mike Conley talks with the media about Thursday’s matchup with the Thunder. Check out all the action from Thursday night’s game against the Thunder in Oklahoma City. Jaren Jackson Jr. nets 27 points and 7 rebounds in the match against the Thunder. 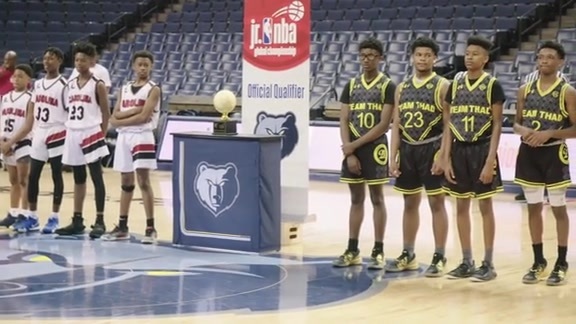 Jaren Jackson Jr. bullies his way to a bucket and a trip to the free throw line. Julian Washburn shows his athletic ability with a steal and a save against OKC. Mike Conley banks a floater off the glass for two. 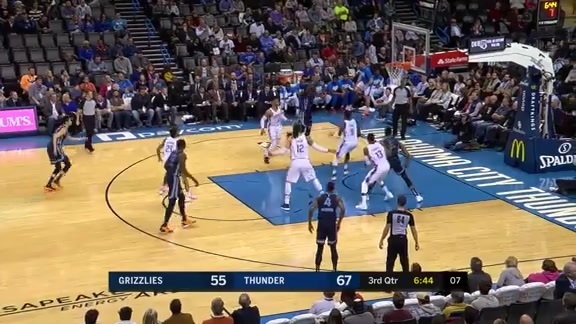 Jaren Jackson Jr. turns a rebound into two points to put the Grizzlies up by two before the end of the first half against the Oklahoma Thunder. Ivan Rabb's block on Dennis Schroder starts the fast break that leads to an easy bucket by Yuta Watanabe. Yuta Watanabe takes the ball the length of the court for two. Jaren Jackson Jr. led Memphis with 27 points (12-18 FG) to go with seven rebounds. Jackson Jr. laid in a putback attempt with 2.2 seconds left, capping a 13-2 run that closed the quarter to give the Grizzlies a 53-51 lead heading into halftime. 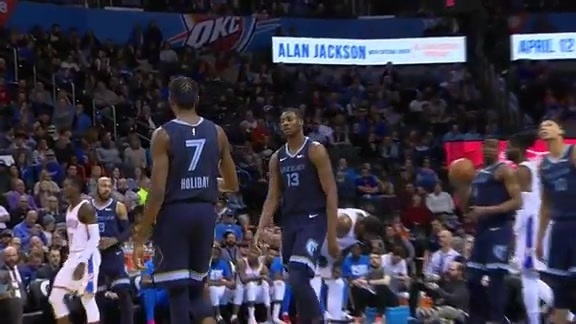 The Memphis Grizzlies tied a season-high for turnovers committed as they lost to the Oklahoma City Thunder 117-95 on Thursday night in Chesapeake Energy Arena. 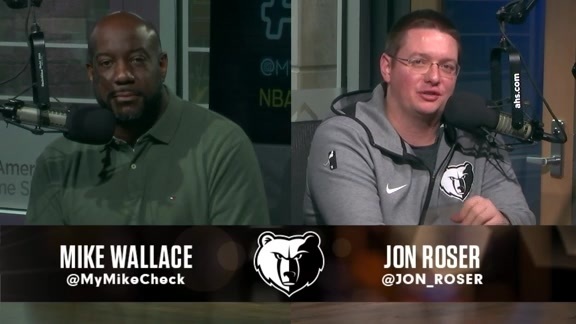 The Grizzlies dropped to 22-34 on the season and 9-20 on the road. The Thunder improved to 35-19 on the year and are now 19-7 at home. The Thunder, who entered tonight leading the NBA in forcing turnovers (17.6 tpg), coaxed the Grizzlies into 24 turnovers, scoring 32 points off the Memphis mistakes. The Grizzlies came into the game ranked fifth in forcing giveaways (15.9 tpg), but converted only 11 Thunder miscues into 11 points. Memphis has now committed 24 turnovers three times this year, most recently on Jan. 19 in Toronto. Jaren Jackson Jr. led Memphis with 27 points (12-18 FG) to go with seven rebounds. Jackson Jr. had his highest scoring total since Dec. 23, when he scored 27 against the Lakers. Bruno Caboclo scored a career-high 16 points while grabbing five boards, which ties a career-best. Mike Conley finished with 15 points and a team-high seven assists. Ivan Rabb nearly recorded a double-double with 15 points and nine rebounds while also blocking two shots. Yuta Watanabe had a career game, scoring a 10 points and pulling down five rebounds in 26 minutes (all career-highs). The Grizzlies finished shooting 34-for-77 (.442) in the game while the Thunder were 43-for-90 (.478) overall. 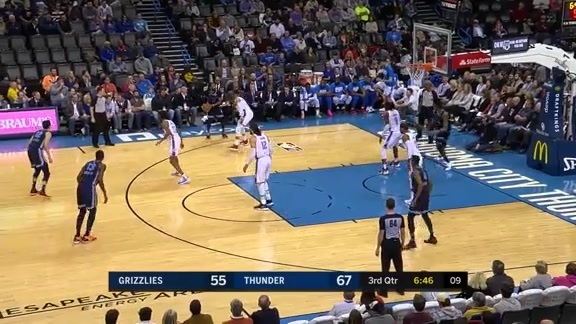 Oklahoma City controlled the pace, outscoring Memphis 22-9 in fastbreak opportunities. Almost half of all the Thunder’s shots were three-point attempts, finishing 17-for-44 (.386) from beyond the arc while the Grizzlies finished just 7-for-24 (.292) from long distance. Russell Westbrook recorded his eighth-straight triple-double, finishing with 15 points, 13 rebounds and 15 assists. It’s the first time in his career that he’s logged eight-straight triple-doubles. Paul George led the Thunder with 27 points and had a game-high four steals. Jerami Grant ended with 20 points while Dennis Schroder added 16 points off the bench. Steven Adams finished with 11 points, scoring all of them in the second half. Terrence Ferguson rounded out the scoring with 10 points. The Thunder executed well coming out of halftime, kicking off the second half with a 16-2 run to earn their first double-digit lead of the night at 67-55. Oklahoma City shot 13-for-24 (.542) in the period and outrebounded Memphis 14-5. After being held scoreless in the first half, Adams had nine points (4-4 FG) in the quarter. 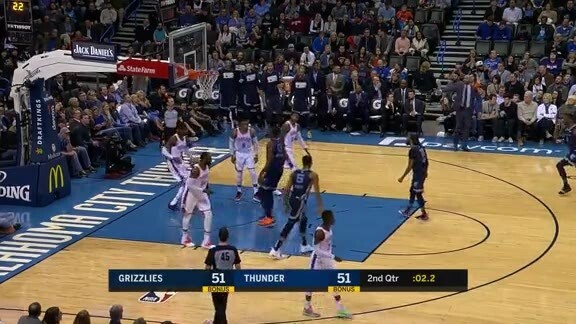 The Grizzlies committed six turnovers in the quarter (10 Thunder points) while the Thunder only had one giveaway (two Grizzlies points). Oklahoma City also outscored Memphis 10-0 in fastbreak opportunities to lead 83-72 heading into the final quarter. Oklahoma City continued to pull away in the fourth quarter, outscoring Memphis 22-6 in the paint as part of making 15-of-26 (.577) shots in the period while Memphis shot just 6-for-16 (.375) from the floor. 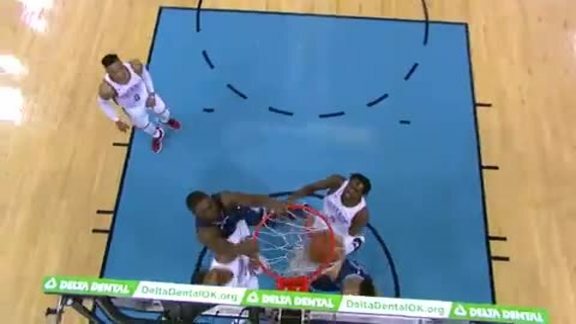 The Grizzlies continued to mishandle the ball, committing eight turnovers (17 Thunder points) in the quarter. The teams had opposite offensive approaches in the first half. Memphis outscored Oklahoma City 28-8 in the paint and won 6-2 on the offensive glass. Meanwhile the Thunder - who averaged 10.5 three-pointers per game entering tonight - made 11-of-28 (.393) triples in the first half, while the Grizzlies were just 4-for-13 (.308). Jackson Jr. took advantage of his mismatches, dropping 20 points in the first half on 9-of-11 (.818) shooting while grabbing seven rebounds and earning two steals. 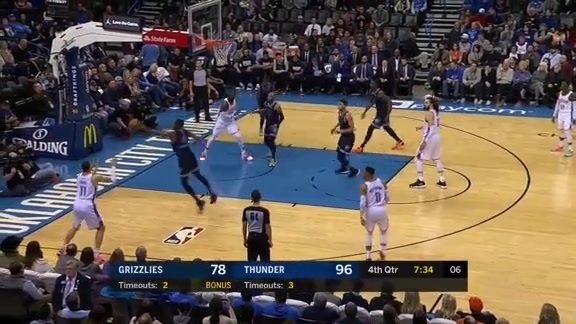 After the Thunder started the game with an 8-2 lead, the teams traded buckets throughout the first quarter, evidenced by the five lead changes and four ties. Both teams were sloppy with the ball, as they combined for 12 turnovers. The Grizzlies dominated inside during the quarter, outrebounding the Thunder 19-8 and outscoring them 16-2 in the lane. Memphis’ success inside led to 11-of-21 (.524) shooting in the opening period, while the defense held Oklahoma City to 8-of-22 (.364) from the floor to help lead 32-27. Oklahoma City continued to take mostly three-pointers in the second quarter, going 4-for-11 (.364) from three while Memphis was 2-for-7 (.286). The Thunder went on a 19-2 run from 8:35 to 3:54 (4:41 span) midway through the quarter to build a 46-38 lead. Holiday and Jackson Jr. hit back-to-back threes, and then Jackson Jr. laid in a putback attempt with 2.2 seconds left, capping a 13-2 run that closed the quarter to give the Grizzlies a 53-51 lead heading into halftime. The Grizzlies will return to Memphis to take on the New Orleans Pelicans for the final time this season on Saturday, February 9 in FedExForum at 7 p.m. CT. Saturday’s game will also be a Grind City Wrestling Night, where the first 5,000 fans in attendance will receive a Wrestling Scarf. Come out to the game, tune in to FOX Sports Southeast presented by Pinnacle Financial Partners or listen on 92.9 FM ESPN to follow the action. I think we ran out of gas a little bit. Give them credit. Don’t take anything away from what they did, but they ramped it up. They understood coming into the game this situation we were under. Our guys competed. They gave it what they had. At the end of the day, they were just too much for us tonight. Well, I think it’s been not something that just happened today but something that’s been weighing for a while. You talk to Mike about how he’s been feeling about it and it is emotional draining. When it’s a mental drain, it becomes a physical drain and it wears you down. As tough as it is and as it has been, we’re looking forward to just moving on and getting past it and playing some good basketball. Yeah. I think there’s been growth and I think there’s been a development. Give our assistant coaches a ton of credit for working with him, helping him improve. Give him credit for putting in the time and wanting to get better. But I see growth there and the development, from the beginning of the year to now, has been really good and him understanding the situation we’re under now. More is going to be put on his plate. He’s a guy that’s never shy away from the moment. It’s been a long day. It’s not over because I’m still not in bed yet, which I’m looking forward to being. It’s just a long day. I’ve had a lot of those this year. I’ve been alright. I can’t really telegraph as much. I telegraph a little too much, at least on my turnovers because the teams’ scouts know a lot of my tendencies. I’ve got to mix it up a little bit, make sure I’m getting where I want on the floor, making better reads. Sometimes I get to forcing a little bit. I’m getting more and more comfortable. That comes every day. There’s a lot of things I’ve got to do, for sure. It’s been a long day. I’m normally worried about the game, watching film, things like that, but I’m sitting downstairs in the lobby until 1:30 or 2:00, waiting for the trade deadline to pass and trying to figure out if I’m going to be here or not. To see Marc end up going, and JaMychal and Garrett. Your whole team has suddenly just changed. It’s hard to lose guys that you consider brothers, and I consider every one of those guys — Marc, JaMychal and Garrett — they’ve all played parts in all of our careers, especially mine. It is very hard to lose guys. On the other hand, we’re excited to get the guys we’re getting in the trade, but it definitely was a hard day for a lot of us. Bruno Caboclo scored a career-high 16 points while grabbing five boards, which ties a career-best. Yuta Watanabe had a career game, scoring a 10 points and pulling down five rebounds in 26 minutes (all career-highs).